Hot Dog Trays and Bags are used by the thousands every day at movie theaters, concession stands, ballgames, and other event. Concession stands use disposable paper containers and bags to serve hot dogs to their patrons watching the event. Roundeyesupply is the #1 foodservice distributor to concession stands for their disposable hot dog supplies. We stock top brands like Bagcraft, Handy Waks, Hoffmaster and more. We sell them their cups, cup holders, napkins, straws, condiments, nacho trays, and much more. Handgards Hot Dog Side Load Bag - 8.5 in. x 4.5 in. 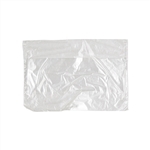 Handgards Hot Dog Bag Clear - 5.25 in. x 10 in. Handy Wacks Hot Dog Trays - 8 in. Smith Lee Medium Weight Closed End Hot Dog Tray 8 in. 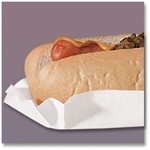 Paper Hot Dog White Medium Weight Tray - 6 in. Red Check Hot Dog Tray Paperboard - 7 in. x 2.75 in. x 1.5 in. Plain Hot Dog Food Tray White - 10.25 in. x 1.5 in. x 1.25 in. Disposable Hot Dog Trays and Bags are the standard for ballpark concession stands.